Beautifully proportioned and timeless in style, Craftmade Bent Glass collection adds a distinctive finishing touch to a traditional-style home. 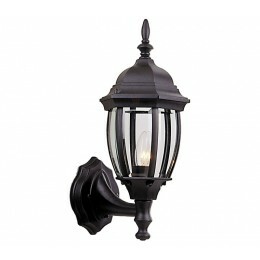 The elegant lantern shape is meticulously crafted. The pristine finishes offer extraordinary durability for classic beauty that will never fade away. The Craftmade Z268-RT Bent Glass collection Outdoor Wall Lighting in Rust uses Incandescent light output and brings Arts and Crafts style. This item is 16"H x 6.5"W. The wattage is 100. The Craftmade Z268-RT requires 1 bulb (not included). Additional Information: Shade-Clear Beveled.